On Columbus Day this past October, the weather in Washington, DC, was breathtakingly perfect. I know this because I was there. Several weeks prior, I had committed to going on a same-day marathon trip with a group of 15 others to visit an array of monuments and museums in Washington. As with many such “extra-curricular” additions to my calendar, it sounded simply wonderful at the time I registered. As days passed and the trip date grew nearer, I began to question my decision to take an entire day away from work and be away from my kids on a day with no school. I had to leave the house before 5 in the morning only to return well after 11 that same night, and get up for work just six hours later the next morning. In this light, it didn’t sound all that appealing. The items on my to-do list seemed to grow as the time before the trip continued to shrink. And so began my inner monologue: “You’ll take your laptop and work on the plane, on the bus, and in between things. There’s bound to be down time. You’ll get it all done; you always seem to.” And off I went. A big draw for the trip was that four of my very dear friends were also joining for this day—one even leading the trip. From the moment we pulled out of the dark, starlit driveway to head for the airport, I somehow knew I’d made the right decision. Of course, I didn’t open the laptop at the gate; there wasn’t time. Of course, I fell asleep on the flight. And on the bus ride from Reagan International to our first stop, the Jefferson Memorial, it never entered my mind to even consider working. I was already enchanted by the ride, the view, the stories, the laughter, and the impact of the monuments. Just before midday, our little bus parked along a curb and we all got out, a routine we’d adjusted to on prior stops. We walked along a pale granite wall that I later learned is the Inscription Wall. We had arrived at the Dr. Martin Luther King, Jr., Memorial. While I’d visited other memorials at various times, this was my first exposure to this particular memorial. The granite stretched on. At perfectly orchestrated increments, exquisitely carved, perfectly proportioned capital letters formed excerpts from Dr. King’s many speeches. Some I knew; others new. All were thought-provoking and powerful in their clarity and simplicity. How often have we been taught that it is harder to express thought with fewer words than many? Every excerpt was a stunning example of Dr. King’s effective distillation of complexity that goes beyond any words. Then I saw it—the towering memorial edifice itself, the Stone of Hope. There, in front of me, truly larger than life, was a white stone sculpture in the image of Dr. King himself. Armed folded, expression thoughtful, and impact indescribable, this strategically placed work in massive stone, over 28 feet tall, had caught me. Suddenly the enormity of the issues, the struggles and the pain of so many, and the certainty of Dr. King’s convictions were all depicted in the single sculpture of a single man. The crisp fall day with its perfect blue sky and sunlight reflecting off the Tidal Basin cast precision shadows that only strengthened the experience. Justice, democracy, hope, and love, key messages of Dr. King’s, were each underscored for me everywhere I turned. I was riveted. In that moment, I knew. I was right to have come. I was changed for having made time that day for a trip that mattered—and continues to matter—on so many levels. Now, when I think of that day, I’m immediately transported to that moment at this memorial. Those vibrant feelings of heightened awareness, pride, and strength come flooding right back. All because I made time to go and I made space from my work—to see and be present. When I discovered the quotation by Dr. King that opens this blog post, I knew this was the right story to share to accompany his message. 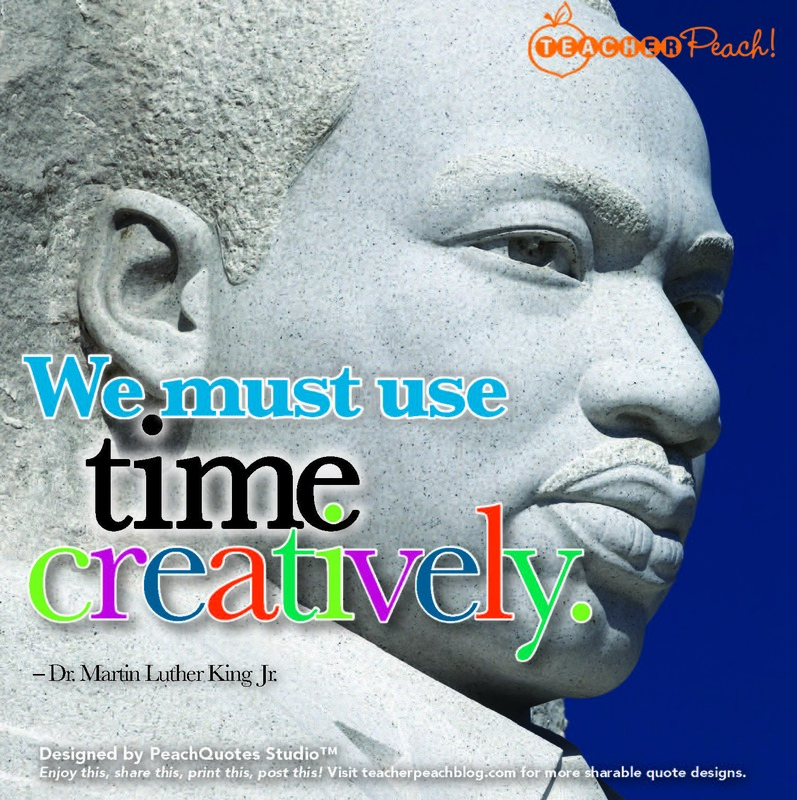 Yes, we all must use time creatively. As I write this post, I recall that I did have a lot of work to do for Teacher Peach that day, and by applying some creative problem solving, I got it all done. Of course, I cannot remotely describe that work at all. Yet, I recall immediately the awe and amazement I felt and still feel for this incredible contributor to our country’s history and for master sculptor Lei Yixin who brought this memorial to life. As we move through this first month of January, time feels like an easy companion, not yet fighting us with the urgency to choose. It still seems there’ll be plenty of time to do it all, much as it felt weeks before this trip last October. Urgency and choice are two key filters for how we decide to use time. The third filter, as Dr. King described, requires us to creatively use time. While there may a limit to the time we have, creatively using the time we have expands our ability to choose wisely and can offset the urgency that “urges” us to try to do it all. I’ll always be grateful for the creative choice I made to spend that October day with special people who matter deeply, sharing experiences I’ll never forget, and honoring a man who helped change so much for so many. As you move through the second half of January, you’ll undoubtedly need to make your own choices about how to wisely, creatively, and efficiently use your teaching time. In honor of Black History Month, we’re including a worksheet of this quotation by Dr. King. We’ve also included two more worksheets with a “timely” quotation from Maya Angelou and Nelson Mandela, respectively, so you can “ch-use” with your students in mind. 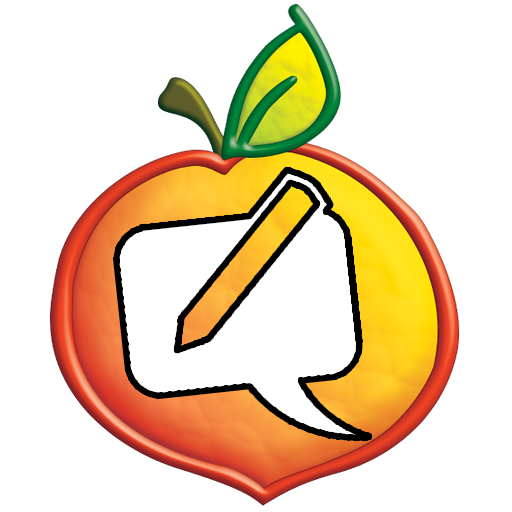 We look forward to hearing how you opt to use these PeachQuotes Studio™ Worksheets in your classroom. We so hope you’ll take just a sliver of time to share your creatively chosen teachable moments. Share an experience that you’ve had like my amazing trip to Washington, too. I understand Maya Angelou’s words so well—the Martin Luther King Memorial definitely took my breath away!